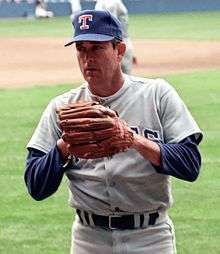 Lefty Grove (not pictured), Sandy Koufax (left), Nolan Ryan (right), and Randy Johnson (not pictured) are the only pitchers to achieve an immaculate inning on multiple occasions. In baseball, a strikeout occurs when a pitcher throws three strikes to a batter during his time at bat. Seventy-five different pitchers have struck out three batters on nine consecutive pitches in a half-inning of a Major League Baseball (MLB) game as of 2016, the most recent being Juan Nicasio of the Pittsburgh Pirates on July 4, 2016. Four players have accomplished the feat—commonly known as an immaculate inning—more than once in their career; Lefty Grove, Nolan Ryan, and Randy Johnson each did it twice, while Sandy Koufax accomplished the feat three times. No player has ever struck out four batters on twelve pitches in an inning. John Clarkson was the first player to strike out three batters on nine pitches, doing so in the third inning for the Boston Beaneaters against the Philadelphia Quakers on June 4, 1889. Out of the 75 pitchers who have accomplished the feat, 58 were right-handed and 17 pitched left-handed. Thirteen of these players (including nine active pitchers) have played for only one major league team. Five pitchers—Roger Clemens, Bob Gibson, Randy Johnson, Pedro Martínez and Nolan Ryan—are also members of the 3,000 strikeout club. Sloppy Thurston, Wade Miley and Ryan are the only rookies to have attained the milestone. Ryan struck out three batters on nine pitches in the American League and National League, becoming the only player to achieve the feat in both leagues of MLB. Danny Jackson is the sole player to pitch an immaculate inning in the World Series. Once a relatively uncommon feat – there were no known immaculate innings thrown from 1929 through 1952 – there has been at least one immaculate inning (and often more) thrown every year since 2006. In total, 41 of the 80 of the known immaculate innings have been thrown since 1997. Of the players eligible for the Baseball Hall of Fame who pitched an immaculate inning, twelve have been elected and five were elected on the first ballot. Players are eligible for the Hall of Fame if they have played in at least ten major league seasons, and have either been retired for five seasons or deceased for at least six months. ↑ "Guide to baseball". BBC News. BBC. Retrieved December 1, 2012. ↑ Kovacevic, Dejan (September 5, 2009). "Ohlendorf fans 11, including immaculate inning, but Pirates lose". Pittsburgh Post-Gazette. Retrieved April 28, 2013. ↑ Topkin, Marc (August 25, 2010). "Soriano's latest feat is flawless". Tampa Bay Times. Archived from the original on August 28, 2010. Retrieved April 28, 2013. ↑ Found, Gregg (August 24, 2010). "1st Pitch: Pujols pursues 400". ESPN. ESPN Internet Ventures. Retrieved April 28, 2013. ↑ "Career Leaders & Records for Strikeouts". Baseball-Reference.com. Sports Reference LLC. Retrieved December 1, 2010. ↑ "Sloppy Thurston Statistics and History". Baseball-Reference.com. Sports Reference LLC. Retrieved April 28, 2013. ↑ "Wade Miley Statistics and History". Baseball-Reference.com. Sports Reference LLC. Retrieved April 28, 2013. ↑ "Nolan Ryan Statistics and History". Baseball-Reference.com. Sports Reference LLC. Retrieved August 4, 2013. ↑ "Ryan, Nolan". National Baseball Hall of Fame. Retrieved April 28, 2013. 1 2 "October 24, 1985 World Series Game 5, Royals at Cardinals Play by Play and Box Score". Baseball-Reference.com. Sports Reference LLC. October 24, 1985. Retrieved April 16, 2013. ↑ "Baseball Hall of Fame Inductees". Baseball-Reference.com. Sports Reference LLC. Retrieved November 9, 2012. ↑ "Rules for Election". National Baseball Hall of Fame. Retrieved July 6, 2012. ↑ "September 7, 1953 Chicago White Sox at Detroit Tigers Play by Play and Box Score". Baseball-Reference.com. Sports Reference LLC. September 7, 1953. Retrieved April 16, 2013. ↑ "April 17, 1956 Philadelphia Phillies at Brooklyn Dodgers Play by Play and Box Score". Baseball-Reference.com. Sports Reference LLC. April 17, 1956. Retrieved June 4, 2014. ↑ "August 2, 1959 Boston Red Sox at Detroit Tigers Play by Play and Box Score". Baseball-Reference.com. Sports Reference LLC. August 2, 1959. Retrieved April 16, 2013. ↑ "June 30, 1962 New York Mets at Los Angeles Dodgers Play by Play and Box Score". Baseball-Reference.com. Sports Reference LLC. June 30, 1962. Retrieved April 16, 2013. ↑ "April 19, 1963 Houston Colts at Los Angeles Dodgers Play by Play and Box Score". Baseball-Reference.com. Sports Reference LLC. April 19, 1963. Retrieved June 4, 2014. ↑ "June 15, 1963 Philadelphia Phillies at Milwaukee Braves Play by Play and Box Score". Baseball-Reference.com. Sports Reference LLC. June 15, 1963. Retrieved June 4, 2014. ↑ "April 18, 1964 Cincinnati Reds at Los Angeles Dodgers Play by Play and Box Score". Baseball-Reference.com. Sports Reference LLC. April 18, 1964. Retrieved April 16, 2013. ↑ "April 19, 1964 St. Louis Cardinals at Houston Colt .45's Play by Play and Box Score". Baseball-Reference.com. Sports Reference LLC. April 19, 1964. Retrieved April 16, 2013. ↑ "August 11, 1967 New York Yankees at Cleveland Indians Play by Play and Box Score". Baseball-Reference.com. Sports Reference LLC. August 11, 1967. Retrieved April 16, 2013. ↑ "April 19, 1968 Los Angeles Dodgers at New York Mets Play by Play and Box Score". Baseball-Reference.com. Sports Reference LLC. April 19, 1968. Retrieved April 16, 2013. ↑ "May 12, 1969 Los Angeles Dodgers at St. Louis Cardinals Play by Play and Box Score". Baseball-Reference.com. Sports Reference LLC. May 12, 1969. Retrieved April 16, 2013. ↑ "July 6, 1971 Philadelphia Phillies at Atlanta Braves Play by Play and Box Score". Baseball-Reference.com. Sports Reference LLC. July 6, 1971. Retrieved June 4, 2014. ↑ "July 10, 1971 Montreal Expos at Philadelphia Phillies Play by Play and Box Score". Baseball-Reference.com. Sports Reference LLC. July 10, 1971. Retrieved June 4, 2014. ↑ "September 24, 1971 Philadelphia Phillies at Chicago Cubs Play by Play and Box Score". Baseball-Reference.com. Sports Reference LLC. September 24, 1971. Retrieved April 16, 2013. ↑ "July 9, 1972 Boston Red Sox at California Angels Play by Play and Box Score". Baseball-Reference.com. Sports Reference LLC. July 9, 1972. Retrieved April 16, 2013. ↑ "September 8, 1977 Montreal Expos at Chicago Cubs Play by Play and Box Score". Baseball-Reference.com. Sports Reference LLC. September 8, 1977. Retrieved April 16, 2013. ↑ "June 23, 1979 San Francisco Giants at Cincinnati Reds Play by Play and Box Score". Baseball-Reference.com. Sports Reference LLC. June 23, 1979. Retrieved June 4, 2014. ↑ "August 25, 1979 Chicago Cubs at San Francisco Giants Play by Play and Box Score". Baseball-Reference.com. Sports Reference LLC. August 25, 1979. Retrieved June 4, 2014. ↑ "September 11, 1979 Atlanta Braves at San Francisco Giants Play by Play and Box Score". Baseball-Reference.com. Sports Reference LLC. September 11, 1979. Retrieved June 4, 2014. ↑ "August 7, 1984 Chicago White Sox at New York Yankees Play by Play and Box Score". Baseball-Reference.com. Sports Reference LLC. August 7, 1984. Retrieved April 16, 2013. ↑ "September 7, 1987 Pittsburgh Pirates at Chicago Cubs Play by Play and Box Score". Baseball-Reference.com. Sports Reference LLC. September 7, 1987. Retrieved April 16, 2013. ↑ "June 4, 1989 San Diego Padres at Cincinnati Reds Play by Play and Box Score". Baseball-Reference.com. Sports Reference LLC. June 4, 1989. Retrieved April 16, 2013. ↑ "April 29, 1990 Texas Rangers at Kansas City Royals Play by Play and Box Score". Baseball-Reference.com. Sports Reference LLC. April 29, 1990. Retrieved April 16, 2013. ↑ "June 15, 1991 Cincinnati Reds at Philadelphia Phillies Play by Play and Box Score". Baseball-Reference.com. Sports Reference LLC. June 15, 1991. Retrieved April 16, 2013. ↑ "August 30, 1991 New York Mets at Cincinnati Reds Play by Play and Box Score". Baseball-Reference.com. Sports Reference LLC. August 30, 1991. Retrieved April 16, 2013. ↑ "September 6, 1991 Philadelphia Phillies at Houston Astros Play by Play and Box Score". Baseball-Reference.com. Sports Reference LLC. September 6, 1991. Retrieved April 16, 2013. ↑ "June 7, 1992 Houston Astros at San Francisco Giants Play by Play and Box Score". Baseball-Reference.com. Sports Reference LLC. June 7, 1992. Retrieved April 16, 2013. ↑ "May 11, 1994 New York Mets at Montreal Expos Play by Play and Box Score". Baseball-Reference.com. Sports Reference LLC. May 11, 1994. Retrieved April 16, 2013. ↑ "August 6, 1994 Seattle Mariners at Kansas City Royals Play by Play and Box Score". Baseball-Reference.com. Sports Reference LLC. August 6, 1994. Retrieved June 4, 2014. ↑ "August 13, 1995 Pittsburgh Pirates at Los Angeles Dodgers Play by Play and Box Score". Baseball-Reference.com. Sports Reference LLC. August 13, 1995. Retrieved June 4, 2014. ↑ "August 22, 1997 Colorado Rockies at Houston Astros Play by Play and Box Score". Baseball-Reference.com. Sports Reference LLC. August 22, 1997. Retrieved April 16, 2013. ↑ "September 18, 1997 Toronto Blue Jays at Boston Red Sox Play by Play and Box Score". Baseball-Reference.com. Sports Reference LLC. September 18, 1997. Retrieved June 4, 2014. ↑ "September 23, 1997 Kansas City Royals at Milwaukee Brewers Play by Play and Box Score". Baseball-Reference.com. Sports Reference LLC. September 23, 1997. Retrieved June 4, 2014. ↑ "April 14, 1998 Chicago White Sox at Baltimore Orioles Play by Play and Box Score". Baseball-Reference.com. Sports Reference LLC. April 14, 1998. Retrieved June 4, 2014. ↑ "May 9, 1998 Baltimore Orioles at Tampa Bay Devil Rays Play by Play and Box Score". Baseball-Reference.com. Sports Reference LLC. May 9, 1998. Retrieved June 4, 2014. ↑ "June 16, 1998 Colorado Rockies at San Francisco Giants Play by Play and Box Score". Baseball-Reference.com. Sports Reference LLC. June 16, 1998. Retrieved June 4, 2014. ↑ "September 2, 1998 Houston Astros at Atlanta Braves Play by Play and Box Score". Baseball-Reference.com. Sports Reference LLC. September 2, 1998. Retrieved June 4, 2014. ↑ "September 13, 1998 Florida Marlins at Atlanta Braves Box Score and Play by Play". Baseball-Reference.com. Sports Reference LLC. September 13, 1998. Retrieved June 4, 2014. ↑ "July 15, 1999 Detroit Tigers at Houston Astros Play by Play and Box Score". Baseball-Reference.com. Sports Reference LLC. July 15, 1999. Retrieved July 4, 2014. ↑ "September 5, 1999 Cleveland Indians at Baltimore Orioles Play by Play and Box Score". Baseball-Reference.com. Sports Reference LLC. September 5, 1999. Retrieved June 4, 2014. ↑ "April 4, 2000 Los Angeles Dodgers at Montreal Expos Play by Play and Box Score". Baseball-Reference.com. Sports Reference LLC. April 4, 2000. Retrieved June 4, 2014. ↑ "August 23, 2001 Arizona Diamondbacks at Pittsburgh Pirates Play by Play and Box Score". Baseball-Reference.com. Sports Reference LLC. August 23, 2001. Retrieved June 4, 2014. ↑ "April 13, 2002 Houston Astros at St. Louis Cardinals Play by Play and Box Score". Baseball-Reference.com. Sports Reference LLC. April 13, 2002. Retrieved April 16, 2013. ↑ "May 11, 2002 Arizona Diamondbacks at Philadelphia Phillies Play by Play and Box Score". Baseball-Reference.com. Sports Reference LLC. May 11, 2002. Retrieved April 16, 2013. ↑ "May 18, 2002 Seattle Mariners at Boston Red Sox Play by Play and Box Score". Baseball-Reference.com. Sports Reference LLC. May 18, 2002. Retrieved April 16, 2013. ↑ "June 12, 2002 San Diego Padres at Baltimore Orioles Play by Play and Box Score". Baseball-Reference.com. Sports Reference LLC. June 12, 2002. Retrieved April 16, 2013. ↑ "April 15, 2004 Milwaukee Brewers at Houston Astros Play by Play and Box Score". Baseball-Reference.com. Sports Reference LLC. April 15, 2004. Retrieved April 16, 2013. ↑ "June 13, 2004 Houston Astros at Milwaukee Brewers Play by Play and Box Score". Baseball-Reference.com. Sports Reference LLC. June 13, 2004. Retrieved April 16, 2013. ↑ "September 11, 2004 Florida Marlins at Chicago Cubs Play by Play and Box Score". Baseball-Reference.com. Sports Reference LLC. September 11, 2004. Retrieved April 16, 2013. ↑ "June 20, 2006 Detroit Tigers at Milwaukee Brewers Play by Play and Box Score". Baseball-Reference.com. Sports Reference LLC. June 20, 2006. Retrieved April 16, 2013. ↑ "July 6, 2007 Atlanta Braves at San Diego Padres Play by Play and Box Score". Baseball-Reference.com. Sports Reference LLC. July 6, 2007. Retrieved April 16, 2013. ↑ "June 8, 2008 Los Angeles Angels of Anaheim at Oakland Athletics Play by Play and Box Score". Baseball-Reference.com. Sports Reference LLC. June 8, 2008. Retrieved April 16, 2013. ↑ "June 17, 2008 Florida Marlins at Seattle Mariners Play by Play and Box Score". Baseball-Reference.com. Sports Reference LLC. June 17, 2008. Retrieved April 16, 2013. ↑ "June 20, 2009 New York Yankees at Florida Marlins Play by Play and Box Score". Baseball-Reference.com. Sports Reference LLC. June 20, 2009. Retrieved April 16, 2013. ↑ "September 5, 2009 St. Louis Cardinals at Pittsburgh Pirates Play by Play and Box Score". Baseball-Reference.com. Sports Reference LLC. September 5, 2009. Retrieved April 16, 2013. ↑ "August 23, 2010 Tampa Bay Rays at Los Angeles Angels of Anaheim Play by Play and Box Score". Baseball-Reference.com. Sports Reference LLC. August 23, 2010. Retrieved December 12, 2012. ↑ "May 6, 2011 Washington Nationals at Florida Marlins Play by Play and Box Score". Baseball-Reference.com. Sports Reference LLC. May 6, 2011. Retrieved December 12, 2012. ↑ "July 8, 2011 Atlanta Braves at Philadelphia Phillies Play by Play and Box Score". Baseball-Reference.com. Sports Reference LLC. July 8, 2011. Retrieved December 12, 2012. ↑ "August 16, 2012 Boston Red Sox at Baltimore Orioles Play by Play and Box Score". Baseball-Reference.com. Sports Reference LLC. August 16, 2012. Retrieved December 12, 2012. ↑ "October 1, 2012 Colorado Rockies at Arizona Diamondbacks Play by Play and Box Score". Baseball-Reference.com. Sports Reference LLC. October 1, 2012. Retrieved December 12, 2012. ↑ "May 29, 2013 New York Mets at New York Yankees Play by Play and Box Score". Baseball-Reference.com. Sports Reference LLC. May 30, 2013. Retrieved May 30, 2013. ↑ "July 30, 2013 Toronto Blue Jays at Oakland Athletics Play by Play and Box Score". Baseball-Reference.com. Sports Reference LLC. July 31, 2013. Retrieved July 31, 2013. ↑ "May 8, 2014 Baltimore Orioles at Tampa Bay Rays Play by Play and Box Score". Baseball-Reference.com. Sports Reference LLC. May 8, 2014. Retrieved May 10, 2014. ↑ "May 17, 2014 Cincinnati Reds at Philadelphia Phillies Play by Play and Box Score". Baseball-Reference.com. Sports Reference LLC. May 17, 2014. Retrieved May 19, 2014. ↑ "June 2, 2014 Boston Red Sox at Cleveland Indians Play by Play and Box Score". Baseball-Reference.com. Sports Reference LLC. June 2, 2014. Retrieved June 3, 2014. ↑ "June 4, 2014 Los Angeles Angels at Houston Astros Play by Play and Box Score". Baseball-Reference.com. Sports Reference LLC. June 4, 2014. Retrieved June 5, 2014. ↑ "June 14, 2014 Colorado Rockies at San Francisco Giants Play by Play and Box Score". Baseball-Reference.com. Sports Reference LLC. June 14, 2014. Retrieved June 15, 2014. ↑ "September 17, 2014 New York Yankees at Tampa Bay Rays Play by Play and Box Score". Baseball-Reference.com. Sports Reference LLC. September 17, 2014. Retrieved September 18, 2014. ↑ "May 7, 2015 Los Angeles Dodgers at Milwaukee Brewers Play by Play and Box Score". Baseball-Reference.com. Sports Reference LLC. May 7, 2015. Retrieved May 8, 2015. ↑ "May 17. 2015 San Francisco Giants at Cincinnati Reds Play by Play and Box Score". Baseball-Reference.com. Sports Reference LLC. May 17, 2015. Retrieved May 17, 2015.